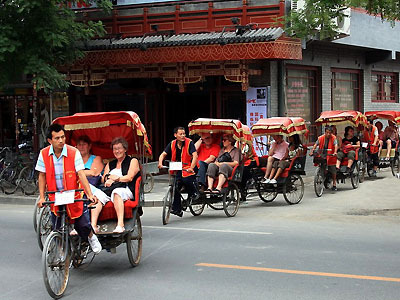 ~Pick you up from your hotel at 07:30 -08:30, drive to Hutong area, old town of Beijing. ~Rickshaw trip in Hutong allies. ~Drop by a typical local house, called Siheyuan in Chinese. ~Climb the Drum Tower or Bell Tower to have a bird’s view of the old face of Beijing. ~Pass by Nanluoguxiang Hutong and Jingshan Park. ~Visit Lama Temple, a time-honored Buddhist temple . ~See cute pandas in Beijing Zoo. ~Take a short exterior visit to Bird’s Nest and Water Cube at Olympic Green.